Meghan, 36, and Harry, 33, wed at St. George's Chapel. Meghan Markle, now Her Royal Highness The Duchess of Sussex, has married her prince. 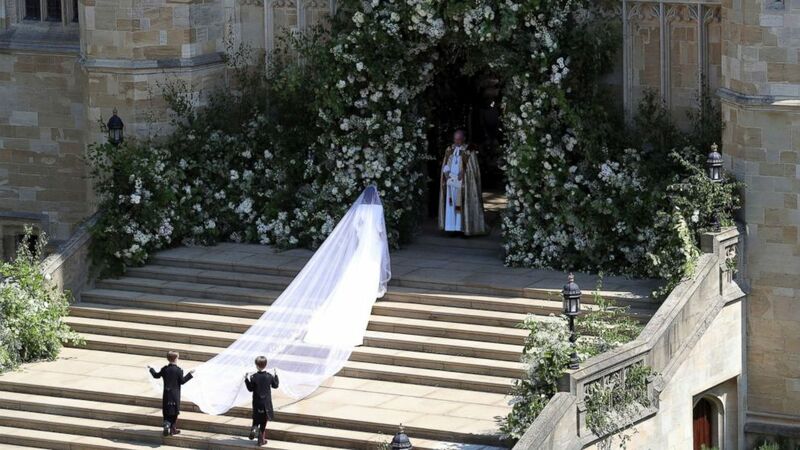 Markle, 36, wore a white wedding dress designed by Clare Waight Keller, the first female artistic director at French fashion house Givenchy, at her wedding to Prince Harry, 33, sixth in line to the British throne. Her tiara, Queen Mary's diamond bandeau tiara, was loaned to her by Queen Elizabeth for the special day. (AP) Meghan Markle arrives for the wedding ceremony of Prince Harry and Meghan Markle at St. George's Chapel in Windsor Castle in Windsor, May 19, 2018. Meghan and Harry’s family and friends had key roles in the wedding. 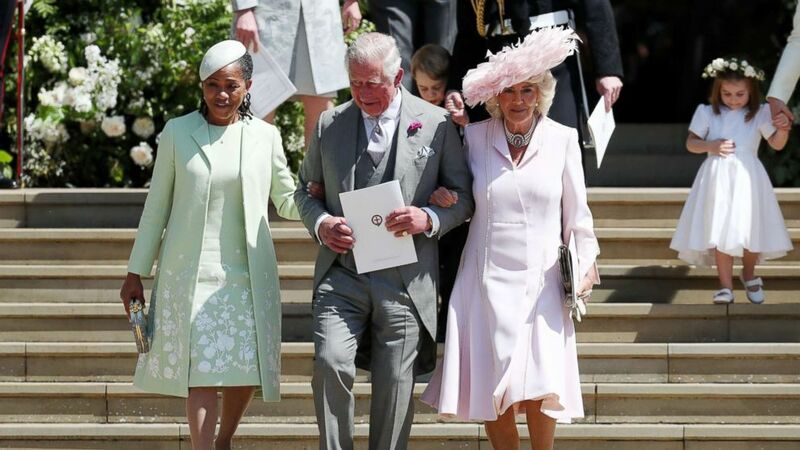 Meghan’s mother, Doria Ragland, rode with her in the car on the way to St. George’s Chapel at Windsor Castle and her new father-in-law, Prince Charles, walked Markle from the quire to the altar. 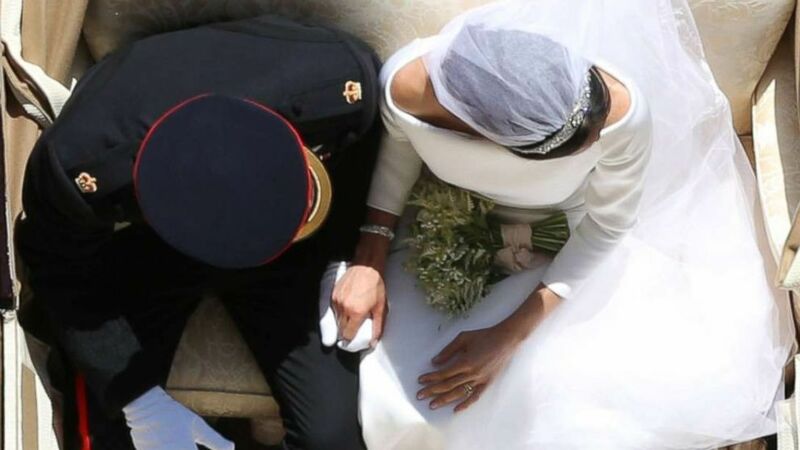 After a moving ceremony punctuated by rousing sermons, beautiful music and plenty of smiles, the new Duke and Duchess of Sussex shared a kiss and rode off in a royal carriage. Prince Harry’s brother, Prince William, stood as best man for today’s ceremony, just as Harry stood as best man for William in his marriage to Princess Kate in 2011. (James Gourley/REX/Shutterstock) Prince Harry and Prince William arrive for the royal wedding Windsor, May 19, 2018. Meghan decided to forgo a maid of honor and instead was joined by bridesmaids -- the equivalent of flower girls in the United States -- and page boys. 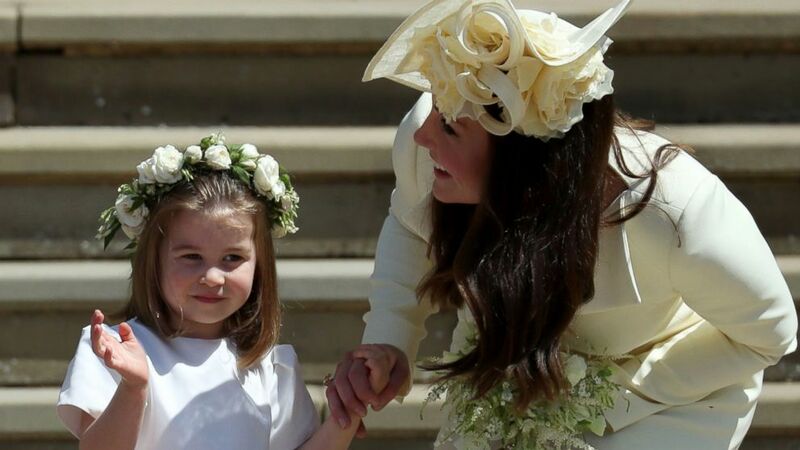 Meghan’s new nephew and niece, Prince George, 4, and Princess Charlotte, 3, had starring roles in today’s wedding as page boy and bridesmaid, respectively. 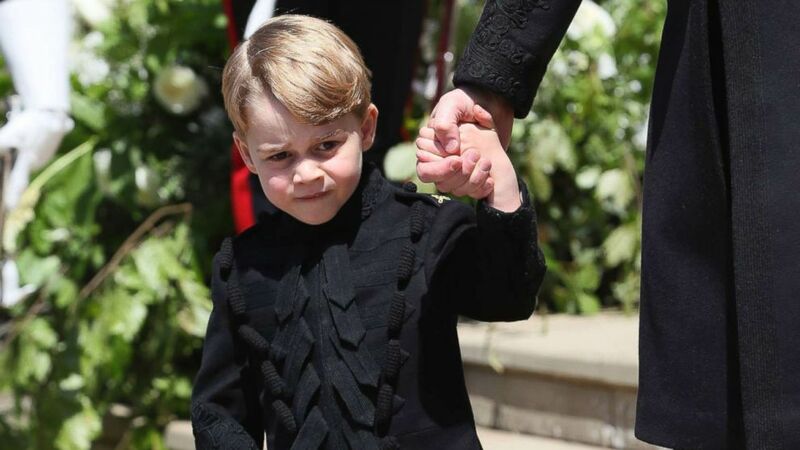 (AP) Britain's Prince George leaves after the wedding of Prince Harry and Meghan Markle at St. George's Chapel in Windsor Castle in Windsor, May 19, 2018. The young royals were joined by Brian and John Mulroney, the 7-year-old twin sons of Meghan's close friend Jessica Mulroney, a Toronto-based entrepreneur and style adviser, who held the train of Meghan’s dress as she walked up the steps to St. George’s Chapel. The fourth page boy was Harry's godson, Jasper Dyer, the son of his mentor and close friend, Capt. Mark Dyer. Rounding out the bridal party were Mulroney's 4-year-old daughter, Ivy; Markle's goddaughters Rylan, 7, and Remi, 6, the daughters of her Los Angeles friend Benita Litt; and 3-year-old Florence van Cutsem and 2-year-old Zalie Warren, who are both Harry's goddaughters. Meghan’s Givenchy wedding dress was made of triple silk organza and featured an open bateau neckline with three-quarter-length sleeves. In addition to her tiara, Markle also wore earrings and a bracelet by Cartier. (Reuters) Prince Harry and Meghan Markle ride in an Ascot Landau along the Long Walk after their wedding in St George's Chapel in Windsor Castle in Windsor, England, May 19, 2018. While Meghan’s dress stole the show, the rest of the wedding party brought their best looks to the special day. Ragland, who walked in ahead of the bride, wore a green wool crepe dress and coat ensemble by Oscar de la Renta, with a silver hat that complemented the look. (Getty Images) Doria Ragland, mother of the bride, Prince Charles, Prince of Wales and Camilla, Duchess of Cornwall walk down the steps at Windsor Castle after the wedding of Prince Harry and Meghan Markle, May 19, 2018. The groom and Prince William wore military attire, while the page boys wore a miniature version of the Blues and Royals frockcoat. "The uniform draws its insignia from the Blues and Royals, which is an old Regiment of The Duke of Cambridge and Prince Harry," according to Buckingham Palace. 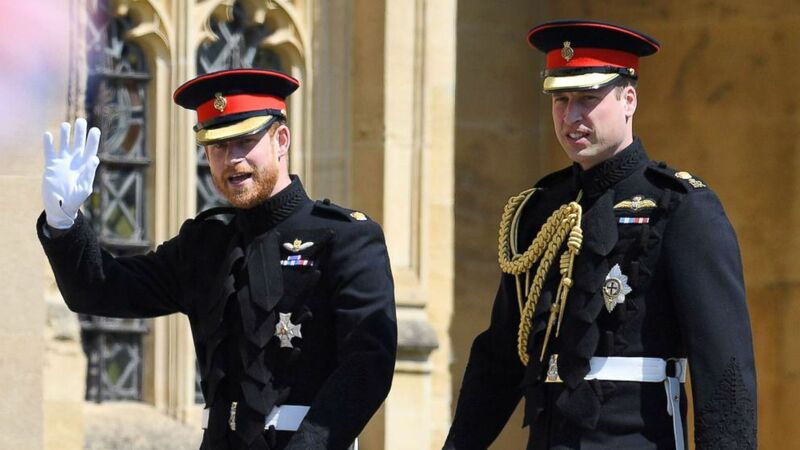 "Both are also wearing Blues and Royals frockcoats for the Wedding Day." 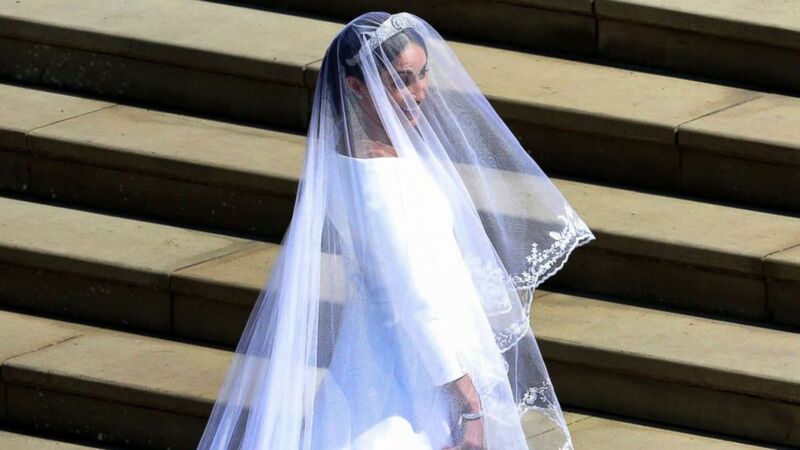 The bridesmaids' dresses were also designed by Clare Waight Keller in the Givenchy Haute Couture Atelier in Paris, according to Buckingham Palace. Their white leather Aquazurra shoes were each monogrammed with their initials and the wedding date, a gift from Markle as "a keepsake of the special day." 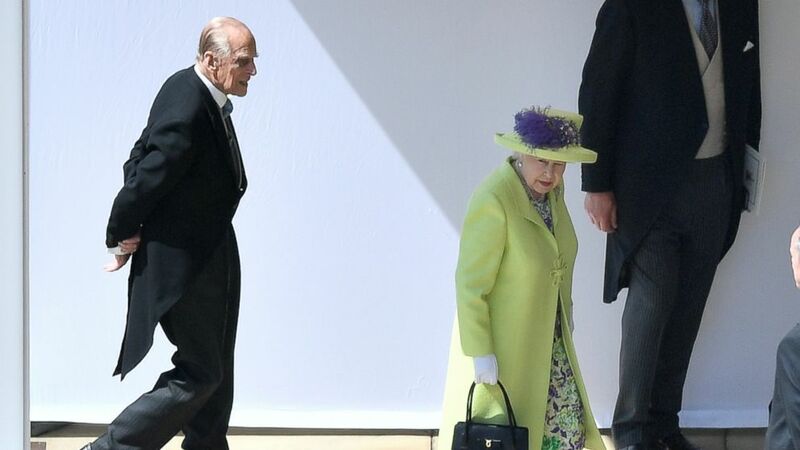 Queen Elizabeth commanded attention in a coat of lime green silk tweed designed by Stuart Parvin and a matching lime silk tweed hat, with purple accents, made by Lucy Price. (Victoria Jones/AP) Queen Elizabeth II and Prince Philip arrive for the wedding ceremony of Prince Harry and Meghan Markle at St. George's Chapel in Windsor Castle in Windsor, May 19, 2018. Princess Kate stepped out for the occasion for the first time since giving birth in a primrose yellow wool silk suit by go-to-designer Alexander McQueen. The ceremony was a personalized reflection of both Meghan and Harry. It began when Meghan walked down the aisle of St. George's Chapel on her own -- behind the Dean of Windsor and in front of her wedding party -- before Prince Charles met her at the quire -- the area of the chapel where the clergy and choir sit -- and escorted her to the altar. The couple recited the Church of England's modernized vows, which omitted the word "obey," during their wedding ceremony. The influence of Harry's late mother, Princess Diana, was felt when her sister, Lady Jane Fellowes, delivered the reading. Continuing to honor Diana, Harry also handpicked several flowers yesterday from the private garden at Kensington Palace, including forget-me-nots, which were Diana's favorite flower. The couple specifically chose them to be included in Markle’s bouquet to honor Diana's memory, according to Buckingham Palace. The Right Rev. David Conner, the dean of Windsor, conducted the wedding service while the Most Rev. Justin Welby, the archbishop of Canterbury, who baptized and confirmed Markle, officiated the couple's marriage vows. However, it was the Chicago-based Most Reverend Michael Bruce Curry, the 27th Presiding Bishop and Primate of The Episcopal Church, who delivered a soul-stirring address that quoted Dr. Martin Luther King Jr. In a performance worthy of a standing ovation, The Kingdom Choir gospel singers performed the classic R&B song "Stand By Me." Sheku Kanneh-Mason, a 19-year-old cellist, also stood out when he performed with the orchestra during the signing of the register. The pews at St. George's Chapel were filled with a who's who of British royalty, along with an A-list roster of celebrities. 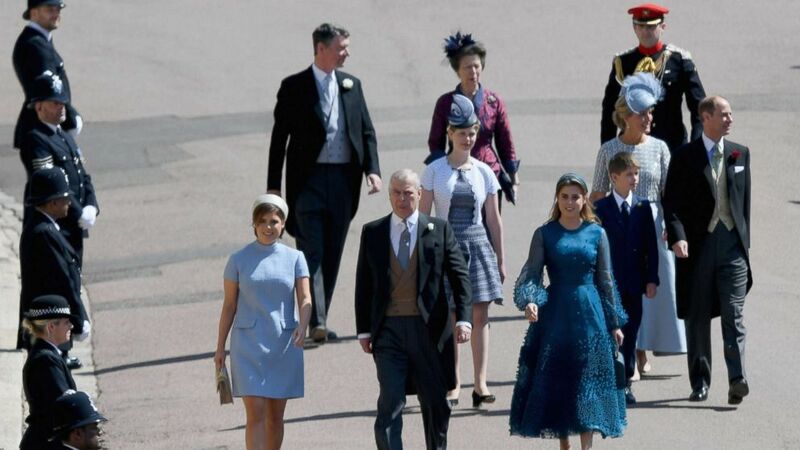 Harry's immediate family were all there, including Queen Elizabeth, Prince Philip, Prince Charles, Camilla, Duchess of Cornwall, Prince William, Princess Kate and their two older children, Prince George and Princess Charlotte. 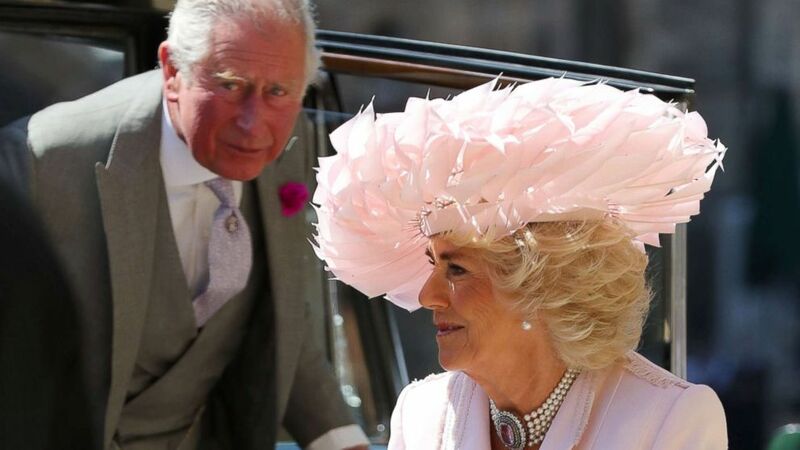 (Gareth Fuller/Reuters) The Prince of Wales and Duchess of Cornwall arrive at St George's Chapel at Windsor Castle for the wedding of Meghan Markle and Prince Harry in Windsor, May 19, 2018. Another relative of note in attendance was Harry's cousin, Princess Eugenie, who will be the next royal to wed at St. George's Chapel when she and her fiance, Jack Brooksbank -- also in attendance at Harry's wedding -- get married there in October. The couple were seated by Eugenie's younger sister, Beatrice, and their father, Prince Andrew. Sarah Ferguson, Eugenie and Beatrice's mother, who divorced Andrew more than a decade ago, also attended the wedding but did not enter with the royal family. Harry's aunt, Princess Anne, uncle, Prince Edward, and their spouses and children also attended. (Getty Images) Princess Eugenie, Prince Andrew, Duke of York and Princess Beatrice and Princess Anne, Princess Royal (rear) attend the wedding of Prince Harry to Ms Meghan Markle at St George's Chapel, Windsor Castle, May 19, 2018, in Windsor, England. Celebrities invited by Harry and Meghan included Oprah Winfrey, Idris Elba, Victoria and David Beckham, George and Amal Clooney, Serena Williams, Priyanka Chopra, James Blunt, Elton, James Corden, "The Great Gatsby" actress Carrie Mulligan with British singer Marcus Mumford. 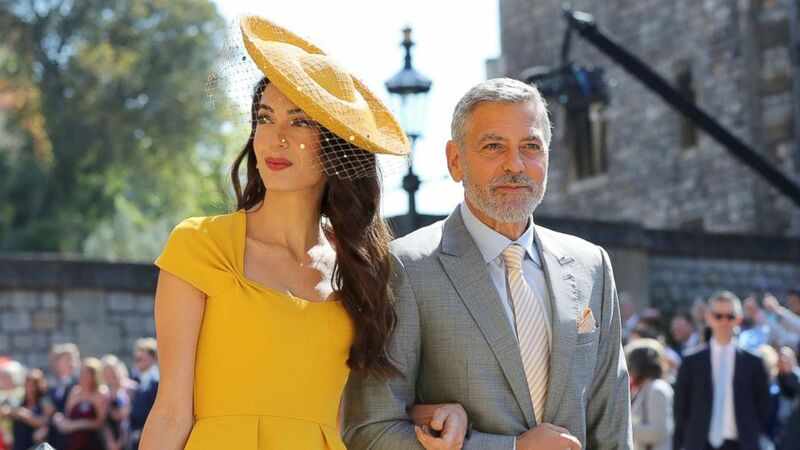 (Gareth Fuller/AP) Amal Clooney and George Clooney arrive for the wedding ceremony of Prince Harry and Meghan Markle at St. George's Chapel in Windsor Castle in Windsor, May 19, 2018. Some of Meghan's former "Suits" co-stars, including Patrick J. Adams and Gina Torres, were also on hand for her special day. 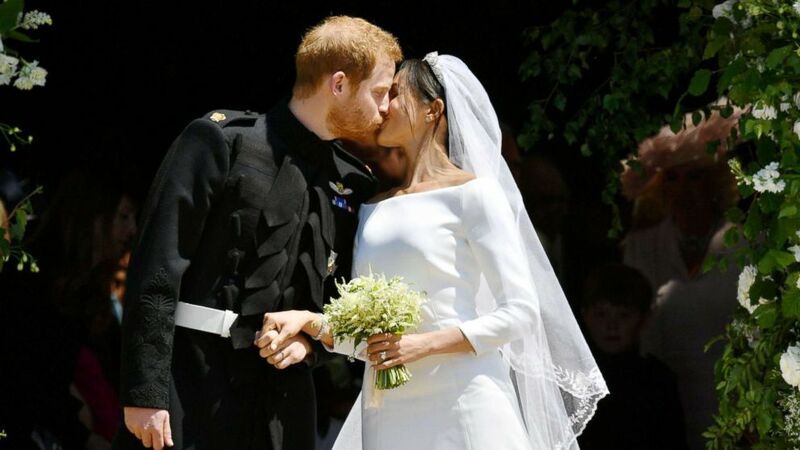 Harry and Meghan sealed their wedding with a kiss as soon as they stepped outside St. George's Chapel. (Reuters) Prince Harry and Meghan Markle kiss on the steps of St George's Chapel in Windsor Castle after their wedding, May 19, 2018. In front of a cheering crowd, the newlyweds exchanged joyful smiles before the kiss. The newlyweds left St. George's Chapel in a carriage procession that wound them through Windsor on a route called the Long Walk. 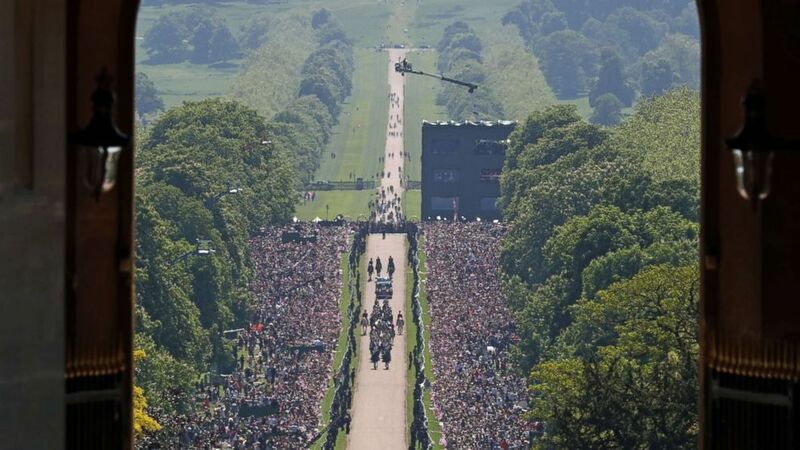 More than 2,000 invited members of the public -- all with ties to charities -- gathered on the grounds of Windsor Castle to watch the wedding carriage procession.